This Lawn Fawn die set features icons including a heart, an arrow, a hand, and more. Lawn Cuts custom craft dies are high-quality steel, made in the USA, and are compatible with most die cutting machines! 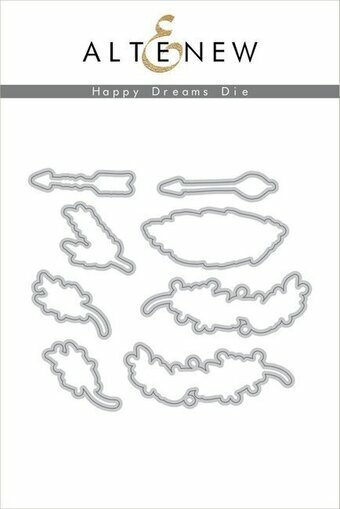 Craft die from Altenew featuring arrows, feathers, and leaves. 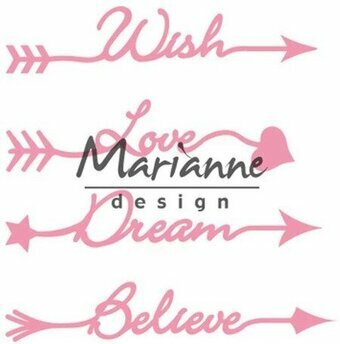 This die set coordinates with our Happy Dreams stamp set. There are a total of 8 dies in this set. Me & My Big Ideas-Puffy Stickers. The perfect addition to all your paper crafting projects! This package contains an assortment of puffy stickers on one 7x2 inch backing sheet. Comes in a variety of themes. Each sold separately. Imported. Craft die featuring arrows. Memory Box/Poppy Stamps craft dies are made of 100% steel. For use on cardstock, felt, and fabric. Cut, stencil, emboss, create! Use in most leading die cut systems. 0.5 x 3.6, 0.5 x 4.1, 0.5 x 0.4 inch. 1.3 x 9.1, 1.3 x 10.4, 1.3 x 1 centimeter. 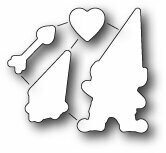 Love themed dies from Memory Box featuring a gnome, a heart, and Cupid's arrow. 4 dies included. Valentine themed Memory Box craft die featuring a bow with 2 heart shaped arrows. Craft dies featuring Arrows. Work with any manual die cutting machine. Use with a magnetic base plate and die cutting plate. Approximate Image Sizes: 1. Banner: 5.75" x 0.75", 2. Arrow 1: 6.5" x 2.75", 3. Arrow 2: 5.75" x 2.25", 4. Arrow 3: 5.0" x 1.75", 5. Arrow 4: 4.5" x 1.25", 6. Arrow 5: 3.5" x 1.0", 7. Arrow 6: 2.75" x 0.5". Craft die from Little B featuring a dreamcatcher, arrows, and more. Craft dies featuring an assortment of arrows. There are a total of 10 dies in this set. Kaisercraft dies featuring an assortment of arrows. These steel dies will cut through cardstock, thin chipboard, felt, acetate, sticky back canvas, sandpaper, foam and much more! They work with virtually any die-cutting machine that will accommodate wafer-thin dies and are sure to become an essential ingredient in your paper crafting process. 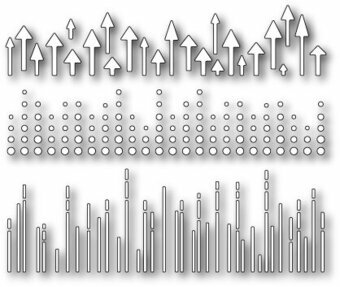 Stand Alone Die set - This is a collection of 3 different arrow options along with coordinating tails. The tails are scored for easy folding. When added to the base arrow, you an add dimension. This set is perfect for so many occasions because they are just FUN. You can customize the colors of each item with different colored card stock and patterned papers. Approximate size - 2 3/4" long. Craft dies featuring arrows. There are a total of 2 dies in this set.